New Winter 2018: Every gal needs a dynamite black high heel that will wow on any occasion! The high fashion black high heel shoe Christmas ornament features a gleaming ebony finish accented with dots of glittering red with a matching heel and ribbon. These ornaments for girls, friends and even a guy you've shared memorable dances with are made from premium glass and coated with multiple layers of lacquer finish to create lasting beauty. 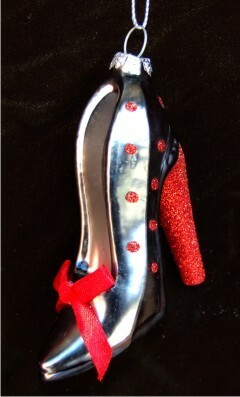 The black high heel shoe with red dots Christmas ornament is one of several in a collection of dazzling footwear from Russell Rhodes. Each one arrives in a soft velvet gift bag ready to steal the show!